The Reformers and Their Stepchildren is interesting and accessible, and will engage the average reader with an admiration for the tenacity and devotion to doctrinal truth of both early rebels and later radicals that opposed the secularization and corruption of the church. The broad brush of history Verduin paints with tends to gloss over any weaknesses in doctrine or practice of the schismatics and leaves the reader with a naively positive view of the groups. In broadly idealizing the schismatics of the early church (as well as the later radical reformers) as virtuous heroes, he by implication in turn broadly villianizes all of their opponents, an unfair characterization of many of the church fathers–and by extension–the primary agents of the reformation, as well. Call them radicals, left-wingers, the “Second Front,” “heaven-stormers,” or “work-saints,” – when Luther and Zwingli turned away from the corrupted doctrines of Rome they found themselves face to face with a group of believers that held to a gospel even more revolutionary than theirs (11-13). 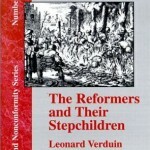 In The Reformers and Their Stepchildren, Leonard Verduin examines the beliefs and hallmarks of these “Stepchildren of the Reformation,” showing that the radical practices and doctrines they espoused were not new creations, but were objections to the corruption of the church that reached back through the Dark Ages all the way to Constantine. Verduin proposes that the “ugly names” attributed to the radicals of the Reformation were the same old names given to ancient “heretics” – those who had consistently protested the state-church and had maintained a fierce devotion to Christ’s pure bride, a free believer’s church (13-19). The first two old names given to the new radicals that Verduin wants to consider are that of the “Donatisten,” recalling the early dissenters against the Constantinian state-sponsored Christianity, and the “Stäbler,” the staff-bearer in contrast to the coercive sword-bearer, in chapters one and two respectively (32, 64). Verduin spends more time in chapter one than in any other place in order to establish the conflict that frames his book: the establishment of the state-sponsored church, as represented here by the sacralism of Constantine’s Roman-Christian empire and continued in the state-enforced religion promoted by Calvin and the reformers, and the protest in favor of the sectarian free church of believers, represented here by the Donatist schism (59, 62). The theme he establishes here permeates every chapter, such as chapter two, in which Verduin traces the staff-bearer appellation of the radical reformers to the early ministers who carried staffs to separate themselves from the warrior Christians of Rome – and maintains that the free church tradition they espoused has led to the freedom of religion found in America (63-64, 93). In chapters three and four, Verduin discusses the “Catharer,” who protested the inevitable moral decay of a secularized church, and the “Sacramentschwärmer,” who resisted the reduction of the Christian gospel to the practice of ritual rather than the change of heart (97, 135). The “Wincklers,” in chapter five, were the evangelists of both the Medieval and Reformation church that were willing to minister and meet outside the recognized church buildings, and the “Wiedertäufer” of chapter six are more commonly known now as the Anabaptists, or re-baptizers (166-167, 189). Each group, for Verduin, represents an ideal of the New Testament church and a continuing theme of the Second Front. The last two names that the later radicals shared with early dissenters were that of the “kommunisten” in chapter seven who wished to share their goods in community, and the “Rottengeister” of chapter eight, who wished to form factions or sects of Christians separated from the world (221, 244). The community of goods promoted by the radical reformers was not the political communism of today, but a Christian ideal of sharing one’s resources with those in need (240). The sectarian’s separation from the world expressed itself most clearly in an aversion to war (especially “Christian warfare”), and by extension a decision that they must avoid the state office that requires the sword (274-275). 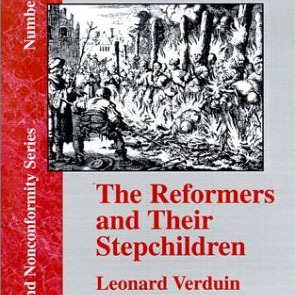 In The Reformers and Their Stepchildren, Verduin makes a fascinating connection between the critical names given to the radicals of the Reformation and the roots of those names in rebellions against the Catholic church in ages past. He successfully traces those appellations to their roots, and shows that the name is useful in drawing similarities in the doctrines and passions of the two groups. In doing so, his intent is to redress those accusations as badges of honor, each one representing a facet of adherence to the New Testament church in the face of the state-sponsored apostatic church. His text is interesting and accessible, and will engage the average reader with an admiration for the tenacity and devotion to doctrinal truth of both the early rebels and later radicals against the secularization of the church. Of course, this strength of the text is also complicit in its greatest weakness. In attaching such a broad survey of the schismatics of church history to such a short space, Verduin is able to skim the most favorable and pertinent information about these groups in his comparison. This broad brush he paints with easily glosses over any weaknesses in doctrine or practice of the schismatics and leaves the reader with a naively positive view of the groups. In broadly idealizing the schismatics of the early church (as well as the later radical reformers) as virtuous heroes, he by implication in turn broadly villianizes all of their opponents, an unfair characterization of many of the church fathers, and by extension, the primary reformers as well. Thus Verduin draws a monolithic line from Constantine to Calvin of black-hatted oppressors of the virtuous true church, placing Luther right alongside the Pope in the apostate church. Though he calls the second front “stepchildren” of the reformation, it is clear that he doesn’t intend to place them as less important, as much as he intends to make the less aggressive reformers – such as Zwingli, Luther, and Calvin – into the equivalent of the evil stepmothers of fairytales. Perhaps Michael Servetus, burnt at the stake as a heretic in Calvin’s Geneva, would agree with Verduin – but church history texts rarely present such a uniformly black and white picture of groups, doctrine, and practice. For example, in his discussion of the Donatists, Verduin rightly emphasizes their dissatisfaction with a secularized state church and an immoral clergy (32-33, 96-97). He neglects, however, the initial origins of the Donatist schism, growing out of dissatisfaction with the ordination of Bishop Caecilian and the rivaling ordination of Bishop Majorinus, Donatus’ predecessor – well before they voiced their protests of the state church. Would the Donatists have opposed the state church of Constantine so forcefully if the ruling had been in their favor at the ecclesiastical court at Rome? And Verduin does not acknowledge the Donatist absorption of the Circumcellions, who were not the “staff-bearers” Verduin promotes in chapter two, but were often armed and aggressive revolutionaries. While he is right to emphasize the positive traits the Second Front shared with early protestors against corruption of the church, Verduin would have done well to balance his treatment somewhat of the schismatics, the Reformers, and the Catholic church. The Reformers and Their Stepchildren is a fascinating text. Though it sometimes presents an overly simplistic and dualistic view of the competing ecclesiologies of Christianity throughout the Middle Ages and Reformation, it forces the reader to take a second look at the radical reformers and their ideological forbearers. While Luther, Zwingli, and Calvin are rightly regarded as leaders of the Reformation, Verduin makes a sturdy case that the Reformation was the continuation of an underground movement that had progressed for centuries, and that where the giants of the Reformation often fell short in their fidelity to the New Testament, the “Stepchildren” of the Reformation were tenacious in their desire to carry the mantle that had been passed down to them. Verduin, Leonard. The Reformers and Their Stepchildren. Grand Rapids, Mich.: Eerdmans, 1964. 292 pp. $42.00. Erwin Fahlbusch and Geoffrey William Bromiley, The Encyclopedia of Christianity, (Grand Rapids, Mich.; Leiden, Netherlands: Wm. B. Eerdmans; Brill, 1999-2003), 1:881. Interesting review of Verduin’s book! I found his book quite eye-opening. The bottom line is that Luther, Zwingli, and Calvin and their followers were complicit in persecuting and killing thousands of humble Christians whose sin was to differ with them. If only those Magisterial Reformers had experienced the love of Jesus that is at the heart of true regeneration! “Knowledge puffs up. Love builds up.” If only they had had your 3-D explanation of love! Even though I am a five-pointer, I identify more with Grebel, Manz, and Sattler. Thanks for your take.